It’s time to leave the city behind and get back to nature. Located between the Allegheny National Forest of Pennsylvania and Allegany State Park in New York, McKean County, Pennsylvania is Trail Central! With 96.3 miles of completed trails marked with blue diamonds, the North Country Trail is the longest trail in the Allegheny National Forest. It is one of three designated National Scenic Trails in Pennsylvania and provides vistas of the Allegheny Reservoir as it passes through rock outcroppings, open hardwoods, old growth forests and stands of hemlock. A trail head with a parking area is located along PA 346 west of the City of Bradford. From this northern point, situated along the New York-Pennsylvania state border, near the Willow Bay Recreation Area, the North Country Trail winds south to Tionesta Scenic Area. The trail then heads southeast to Nanson and southwest through Seldom Seen Corners to the ANF Boundary near Muzette. Perfect for backpacking, the northern section from Rt. 321 to the Red Bridge Recreational Area is approximately 29 miles, so allow 2-3 days. Difficulty level is moderate to difficult. This 7.3 mile trail begins at the Minister Creek Campground and forms a loop. The trail head parking lot is located on Rt. 666 west of Minister Creek Campground, 14.7 miles southwest of Sheffield. Marked with grey diamonds, this trail is for hiking and skiing. Difficulty level is more difficult. A 11.4 mile loop trail. The eastern side is the Morrison Trail Loop and the western side is the Rimrock Trail Loop. Day hikers can complete either portion of the trail in one day. Combining both trails with the cross connector, this system is perfect for a 2-3 day backpacking adventure. Passing through open hardwoods and large rock formations, the ground cover is thick with strands of mountain laurel. The trail head parking lot is located along PA 59, 17 miles west of the City of Bradford. The difficulty level is moderate to difficult. This .2 mile interlocking trail system with a developed overlook. Highlights include the massive rock formations and scenic vistas of the shorelines of the Allegheny Reservoir. From Bradford travel west on PA 59 to a left hand turn onto Forest Road 454 and drive 2.7 miles to access the parking/picnic area. Difficulty is rated easy to moderate in difficulty. This 2 mile trail begins at the trail head off Route 6 near Marvin Creek Bridge in Smethport and travels south to the rear of the historic Poor Farm and County Home. You can also hike up the hill where the trail will join the old roadway of the Bradford, Bordell & Kinzua narrow gauge railroad, which was abandoned early in the 20th century. It is a beautiful trail that partially follows Marvin Creek and traverses wooded settings, open meadows and farm land. This all-season trail is open to hiking, bicycle riding, skiing and snowshoeing. The trail offers ADA parking and is handicapped accessible. Difficulty level is rated easy. Two trail loops totaling 1.4 miles. The Timberdoodle is the nickname of the American Woodcock, one of many birds that you might glimpse along the trail. The Woodcock Loop is marked with a yellow woodcock insignia and features 12 interpretive stops. The shorter Bluebird trail is suitable for wheelchairs or walking assistance equipment and features six interpretive stops. Perfect for casual hikers, parents with children, or first time birders. This trail is rated easy in difficulty. 33.7 miles of interconnecting loops suitable for hiking or cross-country skiing. Drive 18 miles west from the City of Bradford on PA 346, turn south onto PA 321 for 3 miles, turn right into the Tracy Ridge Campground to access the trail head; from PA 59, turn north on PA 321 driving 11 miles. 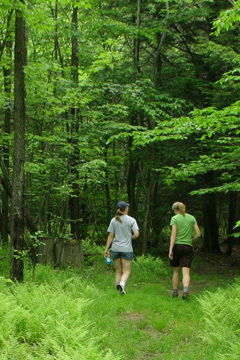 Hemlock groves, meadows, scenic streams, and hardwood forest are sites you will see along this trail. This trail is rated moderate in difficulty. Located just minutes from McKean County, Pennsylvania, Allegany State Park is 65,000 acres and is known for its primitive forested valleys, unglaciated landscape, fall leaves, wildlife, and lakes. There are 19 trails that total 78.6 miles, from easy to difficult. Hiking trails are marked with blue metal discs with either a hiker with a walking stick in black or backpackers in white. Individual trails range from a half mile to 18 miles. The hiking trails go through woodlands, stream valleys, scenic rock outcrops, and attractive overlooks. To access the Allegany State Park from Bradford, drive Rt. 346 to Interstate Parkway, drive north to the entrance gate. Entrance Fee. Welcome to the Tuna Valley, Potato Creek and Kinzua Valley Trail Systems. Opportunities to view wildlife — elk, deer, black bear, grouse, and turkey are good — one might even spy the occasional American Bald Eagle soaring overhead. A 8.3 mile trail connects to the Marilla Springs Trail at the upper trailhead. From there the trail heads west along a narrow gauge railroad grade, crossing Forest Service Road 137 and climbing to reach the Tracy Ridge Trial Network with connection to the North Country Trail. Overnight camping is available at Trace Ridge Campground. Difficulty level is rated moderate to difficult. Bullis Hollow Backpacking Loop. A 1.2 mile hiking trail along the banks of the scenic Tunungawant Creek, located just north of the City of Bradford. From the north travel PA 219 to Foster Brook Exit, turn right, turn right at the light, 1 mile on the right. The trail head is located at the Crook Farm Homestead, a heritage site that features a one-room school house and restored farm house from the 19th century. This trail is rated easy in difficulty. This ¾-mile long trail loops along the banks of Marvin Creek in Hamlin Lake Park in Smethport. Named for the Canada geese that have frequented the lake, the trail skirts the habitats of many wetland creatures, including water fowl. Access is from the northeastern corn of the Guidance Center/Smethport Wellness Center parking lot. Difficulty level is rated easy. This 1.5 mile section is a railroad grade dating back to the 1800s. Part of the Marilla Trail network, the lower end of the trail begins directly behind the Indian Pipe trail head kiosk, five miles west of Bradford along Rt. 346. Difficulty level is rated easy to moderate. This 7.4 mile non-motorized trail crosses 4,000 acres of Allegheny Northern Hardwood forest under the stewardship of the Bradford Water Authority. A multitude of flora and fauna species can be observed from this trail including the Indian Pipe Flower (Monotropa Uniflora) after which it is named. This is a good trail for bicycling, cross-country skiing, and snowshoeing as well as hiking, as it is mostly on roads and is wide and smooth. Travel PA 346 west of Bradford five miles, trail head access is to the right. Difficulty level is moderate. A distinctive hike from the parking area to the new pedestrian walkway-the Kinzua Sky Walk-will provide views of the Kinzua Gorge from a height of over 300 feet. The General Kane Trail named after Thomas Leiper Kane, is a 1-mile loop hiking trail. It leads people through forested areas that were ravished by the tornado, as well as those that remained unharmed. The trail head is located at 41 45, 420N 078 35.133 W. Difficulty level is moderate. A 7-mile trail for hiking, biking: in winter you can experience the solitude and beauty of this trail for cross-country skiing. Located along the banks of the scenic Kinzua Creek, the surface is crushed limestone. The trail head is accessed from the village of Westline. From Rt. 6, travel north on Rt. 219, turn left onto Westline Road. A second trailhead for this linear trail is located at Red Bridge Campground in the Allegheny National Forest along Rt. 321 north of Kane, Pennsylvania. Difficulty level is moderate. A 3.89-mile crushed limestone surface trail open for hiking, biking, cross-country skiing, snowmobiling, and horseback riding. Trailhead parking in Mt.Jewett is behind the Borough office building, at the intersection of Center Street and Peterson Street, and at the Kinzua Bridge State Park. Handicapped accessible. Difficulty level is easy. A 1 mile loop trail with forest and water vistas. Highlights include the Erik Benjamin Covered Bridge which spans the spillway of the Marilla Reservoir, three rustic wooden trestle bridges, and a delightful gazebo located at the southwest corner of the trail. Non-motorized use only. The trail head is located along Rt. 346, five miles west of the City of Bradford. Difficulty is rated easy. This 3.6 mile trail is a slightly more aggressive trail experience fro the avid hiker and mountain biker. The trail begins at the southwest corner of the Marilla Bridges Trail. The limestone surfaced trail offers progressive changes in direction and elevation paralleling Marilla Springs at its point of origin. Difficulty level is rated moderate to difficult. A 1.4 mile 10-ft wide paved surface trail meanders along the west branch of the Tunungwant Creek. The trail features include three bridges, five raised walkways and a variety of natural vistas. Trail access is via Campus Drive, close to the University of Pittsburgh at Bradford. Difficulty level is easy. 3-mile loop, past towering, old growth white pines. Entrance to the trail is at the confluence of Marilla Brook and Lean-to-Run from the Marilla Bridges Trail, follow the run upstream to the white pines. Difficulty level is rated moderate. A system of trails, close to the village of Smethport, are available for hiking, horseback riding, and mountain biking. Many loops can be made, from a short half hour stroll along Sandy Lane to several hours’ worth of vigorous hiking on the North Trail. Begin at the main trail head, located on Rt. 46 north, 1.1 miles from the Rt. 6 intersections, on the left side of the gate. Maps are available at the trail head. Difficulty level is rated easy to moderate. A .75-mile trail that features gigantic rock formations of quartz conglomerate, the world’s largest, several stories high with huge crevices. Stunning vistas that overlook 1,000 square miles are part of the trail. Highlights include Three Sisters, Balancing Rock, a 1000-ton boulder and Indian Face Rock, all natural rock formations. Rock City Park is believed to have been a Seneca Nation fortress at one time. Driving north from Bradford, turn onto PA Rt. 346 east, left turn onto PA Rt. 646. Park entrance is on the left approximately 20 minutes driving time. The park is open May through October, 9 AM to 6 PM daily, trail tickets are sold until 5 PM. Rock City Park is closed during inclement weather. Groups are welcome with advance notice. Entrance Fee. Trail difficulty is rated moderate. A self-guided audio walking tour of Main Street in Bradford highlights the eclectic architecture built by the early oil barons. The largest number of structures, primarily commercial buildings, featuring Neo-Classical, Colonial Revival, Romanesque and Art Deco architecture were built between 1880 and 1920. Brochures and audio tour equipment are available at the Main Street Mercantile, 96 Main Street. Kane is truly a “Star” in the forest – the five highways of Rt. 6, Rt. 321 North, Rt. 321 South, and Rt. 66 appear as a five-pointed star on road maps when they meet in Kane, Pennsylvania. ArtWorks at the Depot, an artisan co-op, and the McCleery Discovery Center, with displays on the Lobo Wolves, are both located within the historic Kane Depot. A self-guided walking tour along scenic Rt. 6 in Victorian Smethport showcases a piece of Americana. Stroll past the Victorian mansions that line Smethport’s Main Street. Tour the Old Jail Museum, allow time to visit the quaint shops and the historic Route 6 Diner. A detailed brochure with map is available in Smethport at the outdoor kiosk in front of the McKean County Courthouse at 500 West Main Street.